' ' Cinema Romantico: Can You Ever Forgive Me? “Can You Ever Forgive Me?” takes its title from a 2008 memoir of the same name by Lee Israel, a one-time bestselling author of celebrity biographies who, in the early 90s, fell on hard financial times and turned to literary forging and theft, typing and selling phony letters from deceased Hollywood greats. She was eventually caught and sentenced to probation, but, like the AA meetings the judge asked her to attend which she claimed she never did, Israel expressed little contrition, in the memoir or otherwise. 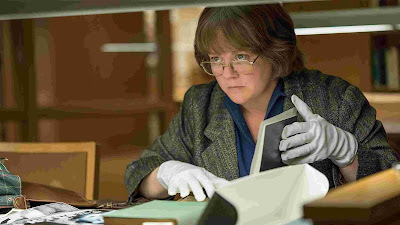 And that unremorseful spirit has been honored in director Marielle Heller’s cinematic adaptation of Israel’s memoir (the screenplay is by Nicole Holofcener and Jeff Whitty), taking its cue from a line late in the movie when Lee (Melissa McCarthy) cites her crimes as the happiest time of her life. “Can You Ever Forgive Me?” pointedly proffers the very question its title asks — what do you think, viewer, can you forgive her? As the movie opens, Lee essentially wills her firing as a copy editor, drinking at her desk and demonstrating all-around irritability with everyone in her radius, swiftly evoking her life’s two massive failures. The first, alcoholism, is both acknowledged by her and rudely dismissed as something like a product of the second, a necessity to go through this awful thing called life. If she was once a bestselling author, she has since fallen on hard financial times, not for a lack of writing talent, necessarily, but a refusal to play the publishing game as her agent Marjorie (Jane Curtin, deft) makes clear. Indeed, Lee makes an appearance at Marjorie’s schmoozing soiree, standing off to the side with a tumbler, passing judgment. Her views on the industry’s misplaced values are not wrong, yet her refusal to engage is played by both the movie and McCarthy as less any kind of idealistic stance than a crippling anti-socialism, evoked in how she steals food from a party she has literally been invited to and literally told to stand there and eat to go home and eat it on the couch next to her cat. Lee’s life of crime is less any kind of lashing out than a last worst chance, engineered when she stumbles upon letters written by Fanny Brice and, needing money for rent and the veterinarian, sells them for a pittance. To increase her profits, she forges letters by inventing more salacious material from the likes of Dorothy Parker and Noel Coward, disappearing into their voices, a skill conspicuously cited by her agent. Lee even goes so far as to claim her Dorothy Parker is better than the real thing, which, whether true or not, certainly comes across in character, much more so than late, lame arguments about this illicit ghostwriting yielding self-discovery for which the movie mounts no real evidence. If anything, her tentative relationship with a dealer she sells to, Anna (Dolly Wells), demonstrates no actualization whatsoever. In another movie, this would have been a telegraphed set-up for redemption; here, redemption is hinted at and then rejected. Ever since “Bridesmaids”, movies have frequently sought out McCarthy to merely duplicate that star-making turn, a comical steamroller capable of verbally, physically running roughshod over every other performer in her wake. 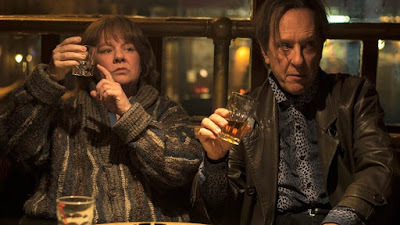 In “Can You Ever Forgive Me?” she is capable of taking everyone to the cleaners too, and sometimes does, but rather than consistently looming large, she seems to shrink, to some place deep inside herself. It says something that in “Can You Ever Forgive Me?” the larger than life persona belongs not to to Melissa McCarthy but Richard E. Grant. Grant plays Jack Hock who half installs himself as, half intrinsically becomes both Lee’s B.F.F. and co-conspirator. If he seemingly materializes from thin air, showing up at the bar where Lee drinks and conversationally thrusting himself upon her, a nominal throwaway line to all his friends being dead nails down the unspoken truth - that is, all his friends have died from AIDS. That is germane to his own loneliness, which is why his boisterous personality meshes so well with someone his exact opposite. If he aids and abets her crimes, he also gets her out of the house, even as he necessarily helps clean her house up, emblematic of trying to rid some of her life’s rot. And in the movie’s most jubilant sequence, Jack and Lee get dressed up and do up the town, even if that’s just going out for drinks, where Jack sidles up to the bar, cigarette holder in hand, as Heller basks in a close-up of Grant, his wide-eyed grin momentarily sweeping the clouds away. The backdrop to this sequence is Mx Justin Vivian Bond, a trans-genre artist, crooning a cover of Lou Reed’s “Goodnight Ladies”, the song’s melancholic adieu to an evening serving as a wonderfully woozy anthem to Lee and Jack living the high life on borrowed time. Reed’s real version appears over the closing credits too, a counterpoint to the opening credits, set to Jeri Southern’s “I Thought of You Last Night”, its image of NYC at dawn evoking a Woody Allen fairytale to purposely put that whimsical image its place. This is not a movie of characters in high rises or holding court at cocktail parties, but the characters on the streets and on the peripheries of those parties, hustlers living dreams they know are lies, antagonists rendered with empathy, and ultimately indifferent to whether you forgive them or not.